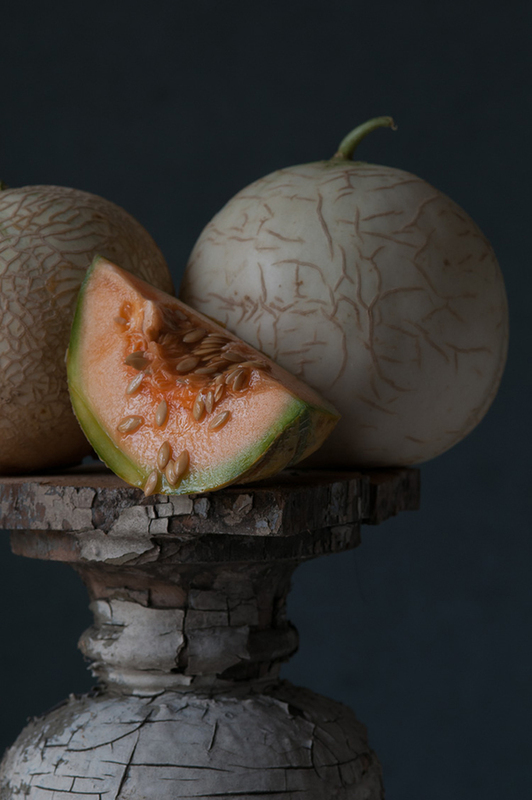 Photographer Lynn Karlin’s rendition of “French ‘Charentais’ with Butterscotch Melons” is part of her exhibit at the James Beard Foundation’s New York Gallery. Photographer Lynn Karlin has a talent for seeing the ordinary in an extraordinary way. Her traveling exhibit, on view now through October 31 at the James Beard Foundation’s Greenhouse Gallery in New York City, is a delicious example. In The Pedestal Series: Natural Beauties, she captures the gorgeousness of common fruits and vegetables in tantalizingly images that are sometimes haunting, sometimes curious, and always done with the detail of a fine art painting. Perfectly round globes of "Charentais" melons teeter on the crackled edge of an old pedestal as a wedge of the cut fruit drips with luscious juices and shiny seeds. The dramatic dark background adds to the sense that this is of another time. Cue the king and the knights ready for the feast. 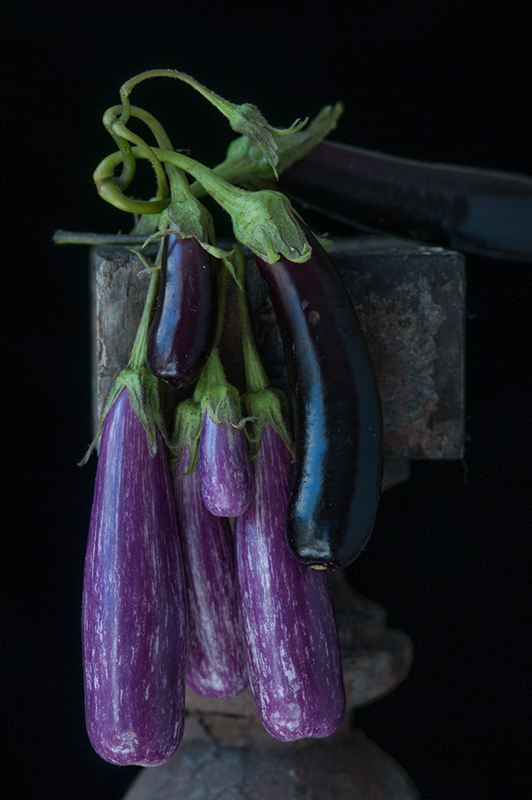 “Tender Eggplants” has the aubergines dangling from a pedestal in this photo by Lynn Karlin. Karlin is a Design New England contributing photographer, who specializes in garden photography and this year won four Silver Awards of Achievement from the Garden Writers Association including for our feature "Almost Heaven" (Design New England, March/April 2012) and the story’s cover photo. This collection of studio work brings control and manipulation to her passion for the garden and its bounty. 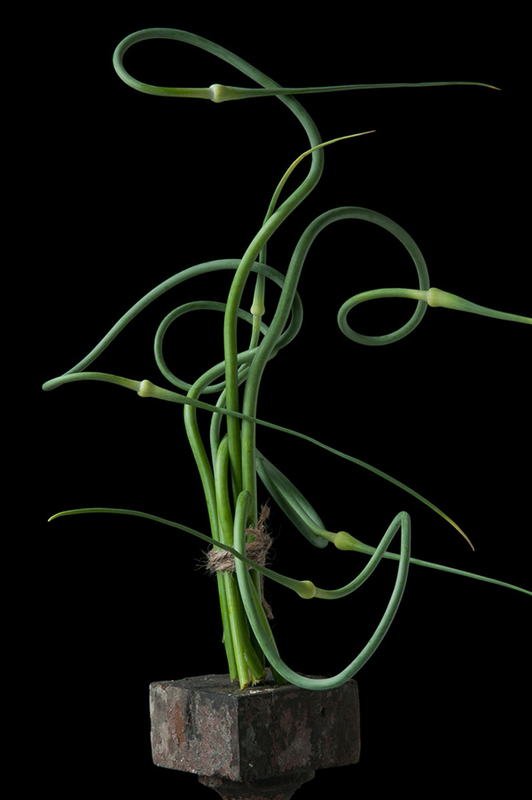 In “Garlic Scapes #2,” Karlin turns the twisting shoots in to mesmerizing sculpture. Greenhouse Gallery at James Beard Foundation, 167 West 12th Street, New York City; jamesbeard.org.